The Caspian Sea can be linked to international waters through Iran's strategic port of Chabahar, the director of Iran's Ports & Maritime Organization in maritime affairs said. 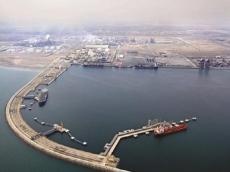 The strategic Chabahar port in southwestern Iran could open a transport corridor to landlocked Central Asian nations, Nader Pasande told the Trend news agency. The main reason behind the development of Shahid Beheshti port in Chabahar was to connect Iran to the International North-South Transport Corridor (INSTC) and the Trans-Caspian Railway, he added. The CIS nations’ corridors should be connected to the INSTC in the future, he said, noting that this way the Caspian Sea can be linked to international waters via the Chabahar port. Pasande further described the connection as a perfect opportunity for the nations of Commonwealth of Independent States (CIS) to boost their economy. He further urged CIS countries to strengthen their bilateral trade and political ties in order to help this happen. It aims to create a reliable transport corridor for the smooth transport and transit of goods and services through Chabahar Port between Afghanistan, India, and Iran.